Lovely spacious brand new luxury ground floor apartment with pool. 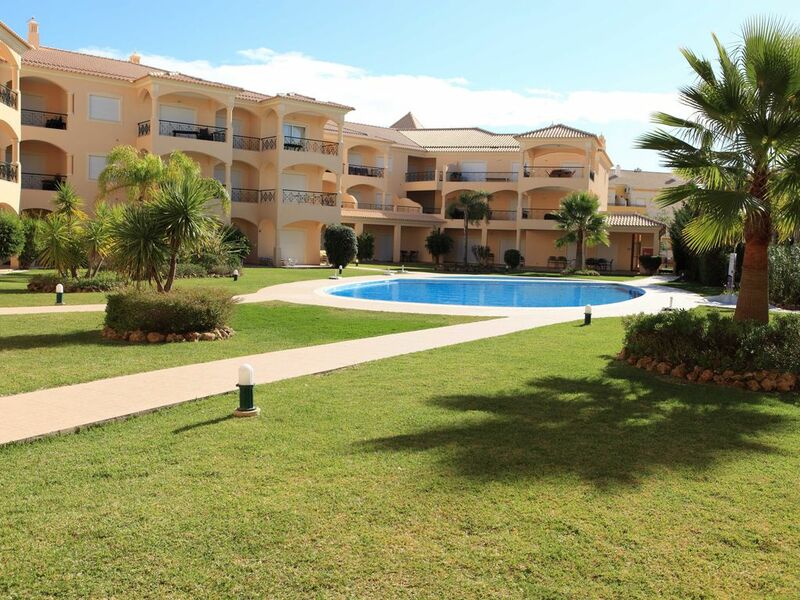 Spacious brand new luxury double room, ground floor self-catering one bedroom apartment with a terrace within Praia Village Complex which leads out onto a beautiful garden and a large swimming pool. The apartment is beautifully decorated with quality furnishings and air conditioning. We are fully licensed and comply with all aspects when renting required by Portuguese law. Our apartment is available for short and long term rental all year round. This apartment has living accommodations for five people but could sleep 2 more. Vilamoura offers family friendly sophisticated surroundings along with award winning beaches, championship golf courses, casino, marina, shops, bars and restaurants. An ordinary bloke with a place in the sun to escape to when things get too much. There is a hydro shower and a jacuzzi bath installed. 5 Golf courses dotted around the Vilamoura area. Ask for details Mini Golf course also located nearby. A wonderful stay. Before we arrived Mark made sure we had all the information we needed and once we were there we felt at home straight away. The apartment is amazing and the complex very clean and welcoming. We had an awesome week and will definitely be returning. Cheers Paul. You and the family are welcome anytime. Just returned from 3 lovely weeks in this apartment. We’ve been to Apartment J many times and find it perfect for us. Very homely, spotless in regards to cleanliness and in a great location, the complex is very quiet and private, so peaceful during the day, the swimming pool and gardens are beautifully maintained. Vilamoura is an amazing town to visit and the marina is exceptional. Thanks Mark for another great holiday. Thanks Hazel. You’re more than welcome anytime just drop me an email. Excellent apartment beautifully laid out. Fantastic customer service from Mark the owner who communicated throughout the booking process. We found the apartment spotless clean it ticked all the boxes for a relaxing peaceful holiday with a accurate description of layout and facilities. I would most certainly return to this apartment in the future and have already recommended it to friends and relatives. Loved our stay at Praia Village and have already booked our return stay. We felt very safe on the complex and the kids made many friends and spent all day playing around the pool leaving the adults to relax. The apartment exceeded our expectations and if anything I didn't think the photo's did it justice. Thanks for those comments Phil. Look forward to welcoming you back in October. If you need anything drop me a message. What a fantastic week we have just had in vilamoura. Our apartment was fantastic and perfect for our little family of 3. The apartment very clean and well equipped. The ground floor location is perfect for the pool and the terrace offers great views over the grounds and pool. Private sun beds mean you don’t need to rush to put your towels out haha. The walk to the harbour was around 15/20mins and only 5 mins to the local Spar supermarket. We were so happy with our stay, we have inquired about staying again next year. Thank you Mark for a wonderful stay. Having rented several properties I think one of the most important things is being able to trust who you are renting the property from. From start to finish Mark was to hand and answered any questions I had almost immediately. The transfers were fantastic real classy vehicle and extremely polite drivers. The apartment was lovely, clean, fully equipped with everything you would need. Even found a bucket and truck for the beach which my grandson loved, kept him occupied. The pool was lovely my grandson did not want to come out of it. 15 mins walk to fantastic falasia beach and marina where there are fab places to eat and drink whilst people watching and watching the sun go down. Children are welcomed in all the establishments. Jaffers and Spar are approx. 15 mins walk from the apartment, Jaffers is the better of the 2 with lots of choice. We added the Uber app and after a full shop the taxi cost 4 euros very reasonable. I would definitely recommend this apartment. The Algarve, situated in the south of Portugal, is an ideal location for a wonderful holiday for all ages. It offers practically year round sunshine and boasts some of Europe's best golf courses. Vilamoura is the tourist resort par excellence. The biggest private holiday development in Portugal has golf courses, a wide range of other sports facilities and an incredible marina with a variety of entertainment. Falesia beach: This is the closest beach to our apartment. When not enjoying the wonderful Algarve sunshine or wandering along the shore, more active visitors can stimulate their adrenaline with sports such as windsurfing, water-skiing, jet-skiing or just relax pedalling a pedalo, fishing or enjoying drinks and snacks in the bar along the beachfront. The colourful shop windows are an invitation difficult to resist. From well known international trade marks to the regional and rustic shops, you can always finds the right gift for that special someone. Golf: The Algarve is renowned for some of the world's finest championship golf courses. Each of the five, 18 hole courses are superbly designed with the par 72 Victoria Golf Course which opened in September 2004, having been designed by Arnold Palmer. It had €18 million invested in it making it one of the best and exclusive complexes in the world. These attract dedicated players and champions worldwide — and are host to numerous prestigious tournaments, several televised. If you're a keen golfer, Vilamoura is the place to be. Four of these courses were the first to be officially recognised for their dedication to preserving the environment, having received an ISO 14001 certificate in 1998. An award of which Vilamoura is very proud — the first environmental certification given to a golf course operator in Europe. Each has its own driving range and a prestigious clubhouse and Vilamoura itself offers a dedicated golfing academy with full teaching facilities, a driving range and a 3-hole practice course to help all levels of players. Vilamoura is a true golfer's paradise, with all five championship courses in the close vicinity of the apartment. Quinta do Lago Golf Club and Vale do Lobo Golf Club are also very close by and are within driving distance. We can put you in touch with agencies to accommodate your golfing needs and discounts. Welcome packs can be provided at a cost of the goods plus €5 service charge If you arrive at the apartment and you require a rep for entry there is a charge of €50 per hour for access Transfers are available to and from the airport approx. €35 each way (up to 4) and €45 for over 4 All prices are payable locally and may flucuate at any point.